It has been created to work with a keyboard and mouse or a touch screen device, then simply add a cash drawer & receipt printer. For example it's compatible with a desktop, laptop or notebook, PC or Mac, Windows 10 Tablet, iPad or Android Tablet. 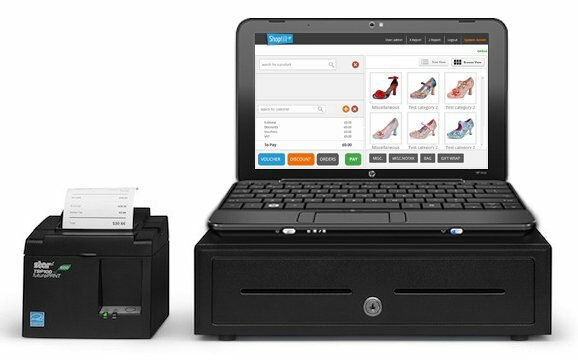 So if you're looking for an affordable Point of Sale platform that delivers more than just a cash register, the ShopTill-e ePOS Till system could be just what you are looking for. 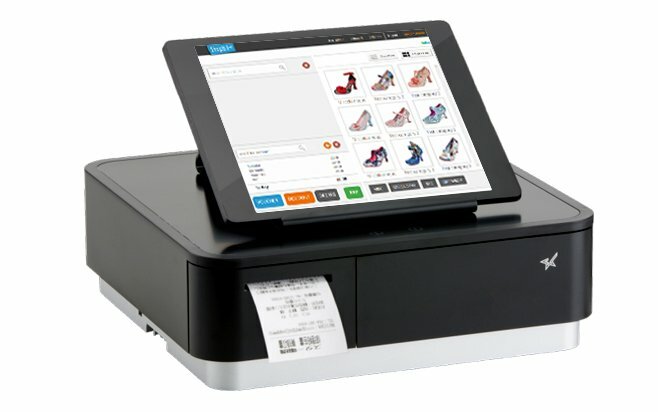 Instant set-up, works with your existing equipment; any computer PC or Mac either with a Touch Screen or with mouse & keyboard, as well as other devices such as a Windows 10 Tablet an iPad or an Android tablet (mPOS). Just add an (optional) bar code scanner and/or receipt printer for extra speed and convenience at your checkout. What ePOS System hardware should I consider? The ShopTill-e ePOS has multi-till point capability so that you can mix and match the hardware depending on your exact needs. When using a desktop PC / Mac you can easily mount a touch screen on your counter top or depending on your counter size put the screen on top of the cash drawer. 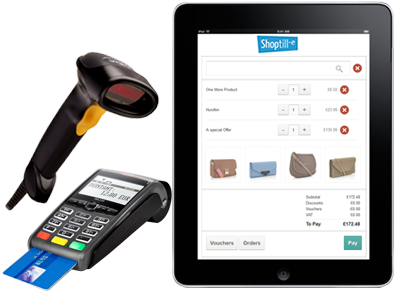 If you don't have a touch screen simply use the ShopTill-e ePOS with your keyboard, mouse and/or barcode scanner. Using a laptop/notebook provides a compact set-up where the computer can sit on top of the cash drawer or counter depending on the counter space you have available. If you have a touch screen notebook use the ShopTill-e touch screen friendly till ePOS screen if not ShopTill-e works just as well with your keyboard, mouse and/or barcode scanner. 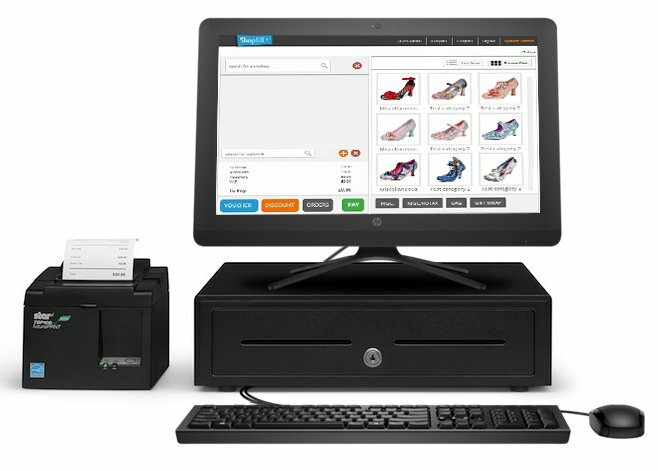 When using a touch screen Tablet such as a Windows 10 Tablet, iPad or Android Tablet with the ShopTill-e ePOS, the Star mPOP provides a good, compact till. The mPOP is a combined cash drawer and receipt printer which makes it easy to relocate, so great for mobile mPOS use with a Pop-up shop, small retail outlets or at festivals, events, exhibitions where space is at a premium. Also the ShopTill-e ePOS will support an external keyboard, mouse and/or barcode scanner, if you prefer. ShopTill-e ePOS works with modern Web browsers which support our offline mode feature e.g. Google Chrome, Safari, Firefox. We recommend using Google Chrome with both PC or Mac computers including Windows 10 Tablets. When using iOS or Android due to the way these operating systems print the Star WebPRNT browser may be required depending on the receipt printer you opt to use. You can read more about receipt printing when using iOS and Android in our support documentation. Click on the images above to view the ePOS System hardware choices in our ePOS online store, alternatively contact us to discuss your ePOS System hardware requirements for your retail business.